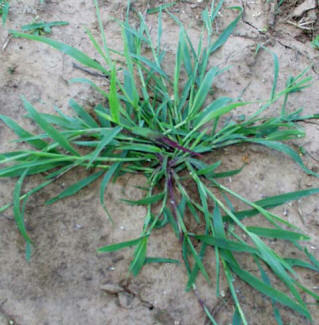 Crabgrass is without a doubt one of the most common grass weeds out there. things you can do to keep it from taking over your lawn. Don't mow your grass too low as crabgrass will take advantage of the increased sunlight at dirt-level. Two and a half to three inches should be about right. Make sure that your grass is thick enough and healthy enough to cover your entire lawn. Like all weeds, maintaining a healthy lawn is the number one way to prevent crabgrass. If sunlight can't reach the soil, crabgrass (or most other weeds for that matter) can't take root. Try to remove crabgrass as soon as you see it. Crabgrass is so fertile that one small spot of it can quickly turn into a full-blown crabgrass patch. Heavily water the soil where you are weeding before removing the crabgrass. Make sure you get the entire root. I can't stress this enough. Crabgrass is one of the toughest weeds. It is bound and determined to take over. In the right conditions, its roots will grow wherever they touch soil. Only use chemicals as a last resort. The bad part is, as far as I know, a herbicide that will only kill crabgrass doesn't exist. When you choose to go the chemical treatment method, other plants will always be vulnerable and may be killed as well. With that being said, there are some Pre-emergent chemicals that do exist for crabgrass control. The problem with this is when to apply it? If you apply them too early, their effects will fade, and the crabgrass might take hold later. If you apply the pre-emergent too late, the crabgrass may already be there.